There are television shows, numerous blogs and endless social media posts all focused on entrepreneurship. It is finally “cool” to be an entrepreneur. Virtually every academic level from grade schools to high school talks about entrepreneurship. So goes the government. All levels of government are jumping on the entrepreneurship bandwagon. Billions of dollars have been thrown at startups and incubators by families, friends, angels, managed funds, universities and the government. Local, state and the federal government also have the ability to give the gift that keeps on giving, tax breaks. According to research by the Kaufman Foundation, Austin, Miami, Los Angeles and San Francisco, Las Vegas and New York, and Boston have the best startup ecosystems in the world. These ecosystems have the funding, the talent, and competitive density to facilitate new business development. Despite the fact that the thought of becoming an entrepreneur is more popular than ever, some reports paint a slightly gloomier picture. The bad news is that the startup rate has fallen from 14% to 8% of total companies over the past 30 years. Unicorns, companies with a $1Billion valuation, are also on the decline and a growing concern. The Financial Times attributes the decline to a lack of access to capital, stifling regulatory requirements, increases in entrepreneurial activity by large companies, and increases in student debt and a very cautious workforce. A recent article in Forbes echoes these sentiments and adds, the Walmartization of America due to Walmart’s infrastructure and buying power. Part of the decline relates to the nature of the beast. Startups fail. And the workforce is well aware of the situation. It is common to hear of failure rates between 80 and 90%. Other sources paint a somewhat rosier picture. According to Scott Shane, in Small Business Trends, larger and older companies have a better chance of survival. About half are still around after five years. It is morphing, changing and penetrating every aspect of traditional business as we know it. Marketing, finance accounting, organizational behavior, and operations have assimilated the entrepreneurship. Marketing for startups focuses on engagement via viral and social networking strategies. Startups eschew traditional channels used for legacy and mature products. Using traditional capital budgeting is just not appropriate for startups. Financial analysis for startups uses a combination of real options theory and qualitative models for evaluation. The ideal composition of startup teams draws on a different literature than traditional team literature. Startups need engagement marketing specialists, product designers and prototyping specialists, experts with infrastructure knowledge for configuring cloud-based applications that are scalable and of course the charismatic visionary. Accounting for startups is all about forecasting and cash-flows. Operations involve a constant struggle to scale production up and down. And how to leverage and address the Amazonification and Walmartization of supply chains. Oh, and don’t forget strategic planning. Traditional planning approaches are confusing, cumbersome, take too long and just not agile. One-page business plans, pitch decks, lean startup approaches and the numerous templates to assist in identifying an opportunity are replacing the traditional strategic planning approaches. This simplified planning allows entrepreneurs to react quickly in response to customer feedback, providing an iterative process that spirals in on the best products and services. No, entrepreneurship is not dead. It is being assimilated into every nook and cranny of successful businesses. Many large organizations have embraced entrepreneurship because they understand that products and technologies have a life-cycle, that consumers will always be attracted to the next big- thing, and because large companies have the resources to invest in entrepreneurship. Being entrepreneurial is the best way to delay and even prevent, the natural decline of business. Nothing is certain, except death, taxes and business decline. It does not matter how much money the current business is making; there is a life cycle for products and technologies, and eventually the business will decline without constant re-priming. Re-priming is essentially an investment decision involving the selection of the right product, the right people, and the right technologies at the right time. Real options theory can help with that decision. Concentrate on executing the existing business model. Focus on selling your existing products and versions. Add more versions to your exiting product line. The current product line looks viable, but needs fine tuning and freshening. Redirect the business in a new direction. 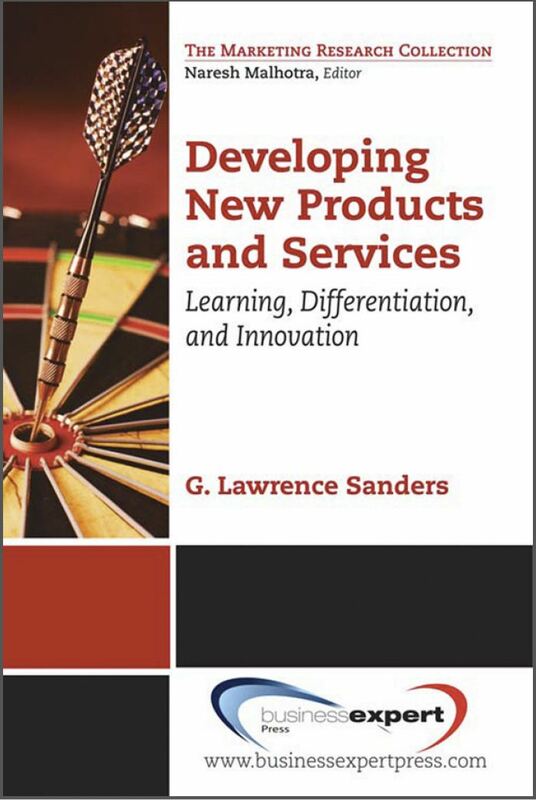 Use existing competencies and acquire additional competencies to develop a new product line. Your existing products are not attracting customers. Abandon the current business. Fail fast and go back to the drawing board. A real option is a decision or choice to invest a little or a lot in a corporate asset such as a business model, a product, or a technology. Real options look very much like the relatively recent concept of pivoting a startup. Eric Ries introduced the concept of pivoting and changing business direction in his 2011 book The Lean Startup. The problem with the pivot concept is that it is a bit simplistic and parochial. The problem with the real options concept, when it is applied rigorously in its academic manifestation, is that it is too abstract and mathematically complex because it is based on stock options concepts. I have expanded on the pivot concept to take advantage of the more comprehensive real options approach by extending the basketball analogy. In basketball the pivot gives you the opportunity to get into the triple threat position. In the triple threat position the player can either pass, shoot or dribble. Check out Kobe Bryant in the triple threat position.). Each game is a continuous series of decisions to shoot, pass or dribble. Each season involves games against some of the same opponents and new opponents with the same shoot pass and dribble decisions. Finally, if the game is too tough, the player and the entire team can just walk off the court, albeit a radical, though sometimes prudent strategy in some situations. 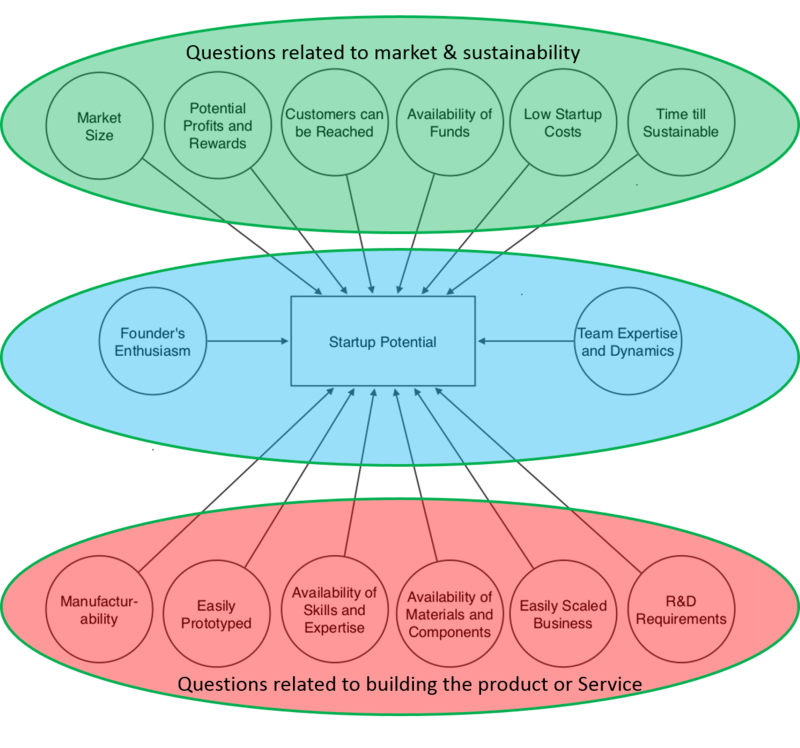 The essence of the model (see Figure 1) is that founders should modify their business model based on the market potential and the degree to which the current founders and employees have core competencies and domain expertise in a particular area. Shoot: Go with the current business model and grow the business as quickly as possible. Dribble: Try to get in a better position by modifying and tweaking the current business model using versioning and identifying appropriate market niches. Identify mashup artists, and marketing expertise. Focus on product design and prototyping. Pass: Dramatically change the current business model. Use some or all of the core concepts of the existing model. Conduct intense R&D and acquire talent and perhaps even acquire a business with the desired core competencies. Get ready to receive the ball and be in the triple threat position develop a new and improved business model. 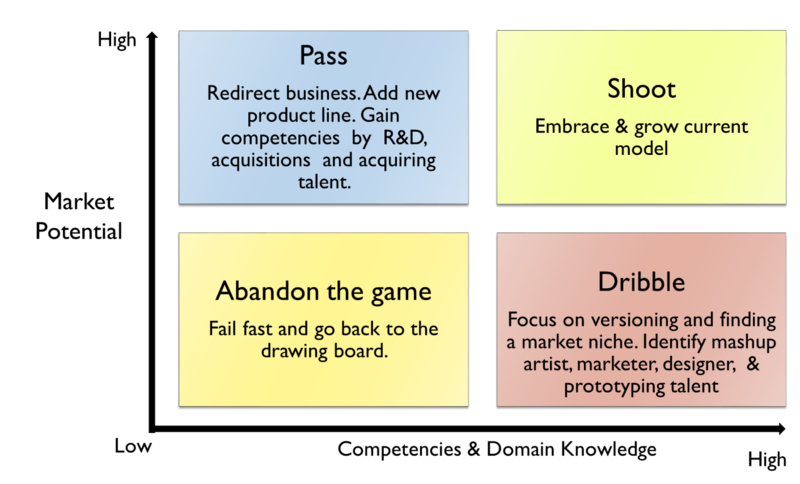 Abandon the game & fail fast. Leave the game and walk off the court. Your position and perhaps your game is not good enough to compete effectively in this situation. Try to improve your game (domain knowledge). You might even have to find a new court to compete on and introduce a new business model that draws on previous experience and new domain knowledge. Market potential refers to the size and the growth rate of a market. The size and growth potential of a market accounts to a large extent the attractiveness of a market and often drives the decision making process for startups and legacy businesses. Questions to be answered include determining the absolute size of the market, how much of the market can be reached and your potential to gain market share. Core competencies are the knowledge, expertise and capabilities of the founders, employees and contained in existing processes. Pivoting and going in a new direction and embracing a new business model is often the key to business survival. But there are implications, because new investments can interact positively or negatively with existing skills and assets of the firm. As noted earlier, nothing is certain, except death, taxes and business decline. As illustrated in Table 1, many old and new economy companies have pivoted their way to success. Survival requires adaptation. It is truly a pivot or perish world and pivoters will inherit the revenues. Real options analysis can be very technical, requiring a significant amount of financial and technical scrutiny. However, using complicated calculations is overkill for startups and small to medium-sized businesses. Real options concepts are nevertheless important. The takeaway from the perspective of the entrepreneur is that you need to experiment and also need to diversify your portfolio of products and projects under consideration. You need to be constantly aware of the pivot. This does not mean that you have to actually buy machinery, make products, and constantly modify your business processes, but it does mean that you should learn-about many products and technologies related to your business and learn-by-doing and experimenting when an opportunity looks promising. As noted in the previous post, you might consider implementing a Chief Illuminati Officer function and start investing in options to keep your company viable. Blockbuster Video and Entertainment Started in 1985 as a home movie and game rental business. Company is non-existent. Casualty of Netflix and Redbox. Had an unsuccessful pivot to online rental. Coca Cola Launched in 1886 to combat morphine addiction. French Wine Coca made of coca, kola nut, and alcohol. Multinational manufacturer, distributor, and retailer of beverages, concentrates and syrups. DuPont Launched as a gunpowder company in 1802. Chemical company producing neoprene, nylon, Corian, Teflon, Mylar Kevlar, Tyvek, Lycra and refrigerants among others. IBM Established in 1911 as Computer-Tabulating-Recording Company. Sold scales, time recorders, meat and cheese slicers, tabulators and punched cards. Designs & manufactures hardware and software, and offers infrastructure, hosting and consulting services for IT and emerging technologies. Nike Started in 1964 as Blue Ribbon Sports by when Phillip Knight distributed Tiger and Asics shoes out of his car. Designer, manufacturer and distributor of sports footwear, apparel, equipment and sports services. Pfizer Established in 1849 and produced an anti-parasitic for expelling worms and citric acid as a flavoring and preservative Multinational pharmaceutical. Procter and Gamble Launched in 1837. Sold soap and candles. Sold Pringles in 2009 and, Jif and Folgers around 2001 Multinational consumer goods company selling pet foods, cleaning agents, & personal care products. This past year I have had numerous teams that had two or three startup ideas. Some of the teams want me to make the decision on what project to select. Most of them, however, just want some guidance on what questions to ask. In its simplest form, the questions should relate to the economic, market, financial, operational and technical feasibility aspects of the idea, along with the characteristics of the founder(s). Here is a list of 14 questions to consider when weighing-in on an idea for a start-up (Figure 1). Many investors and founders look at the size of the market and the potential profits as the critical criterion for investing in a startup. But a startup must be able to capture part of that market and reach those customers through a marketing campaign. In order to become a viable sustainable business, funds are needed to launch the business, regardless of whether they come from the founders, family, friends or investors. If the startup costs for the business are low relative to the availability of funds then the business may eventually exist as a sustainable entity. The enemy is the burn rate or burning cash and not having funds to pay the bills. Long term sustainability is very difficult unless there is some way to obtain recurring revenues in the form of complementary products and services and refreshing the product line through R&D. Q1. How large is the market? Q2. Will the business be able to capture some of the market and realize a profit? Q3. Can the customers be readily identified and reached? Q4. Can funds be secured for starting the company? Q5. Are the startup cost relatively low? Q6. Is the time till the company is sustainable short? These questions relate to manufacturability, which is the ability of the startup to make the product and in the case of services, to set up processes that will be used to deliver a service. These questions are related to the ability of a start-up to develop a viable supply chain. A good indication of degree of manufacturability is whether or not a realistic prototype can be built. The key is to be able to obtain raw materials, components and people and to design processes for delivering a product or service. Scalable business are desirable because they can grow and contract with changes customer preferences and disturbances in the economy. When a product or service involves emerging technologies then research and development will be an important driver of manufacturability and product design. Products and services requiring high levels of initial investment of R&D requirements are inherently risky and contribute to cash burn, even though they can be the ticket to hyper-profitability. Q7. Manufacturability: Is the product or service manufacturable? Q8. Can a prototype or mockup of a product or service be built? Q9. Can employees be secured with the necessary expertise and skills? Q10. Are the materials and components available to build the product or service? Q11. Is the business easily scaled for growth and retrenchment? Q12. Are there minimal initial R&D requirements for manufacturability and product design to get the business going? There is some evidence that the composition of the startup team will have a positive impact on survival. But the evidence is confusing. Diverse teams can in some instances improve firm performance in a very competitive environment. But sometimes, teams that are homogeneous can act quicker when they are well-aligned on strategic decisions. It appears that the team composition should depend on the characteristics of the industry and the product being developed. Many pundits and academics have identified their own typology of what founding teams should look like (e.g. go here for blog discussions, here for Steve Blank’s typology and go here for recent academic research). 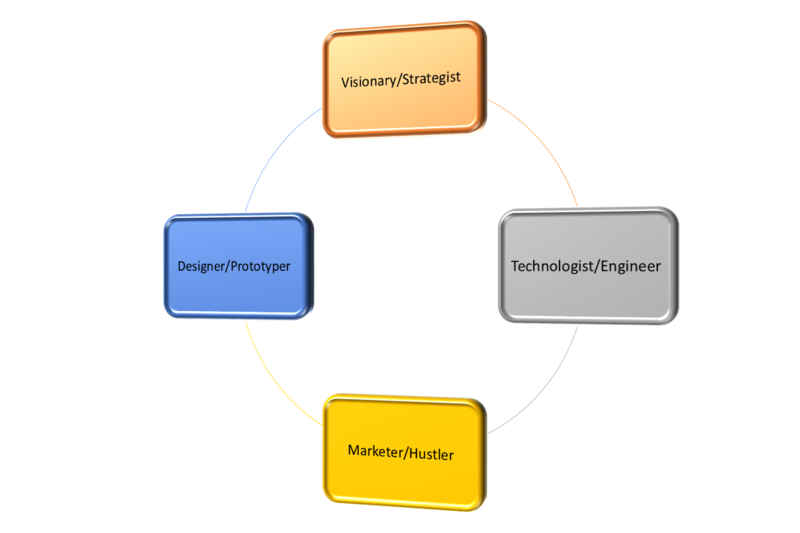 A high-tech startup team might include a founder that is a visionary/strategist, a technologist/engineer founder, a designer/prototyper, and a marketer/hustler (Figure 2). It also appears that founder teams with about 3 or 4 members are more successful than a solo team or teams with more than 4 members. If the founders are familiar with the product then many of the questions related to the market and the manufacturability of the product or service are answered or at least can be addressed. But sometimes, individuals and companies have to jump to a very dissimilar product or service in order to survive. Hard work, and learning about and exploring new product lines by prototyping can lead eventually to familiarity and insight. And of course, ignorance that is fueled by enthusiasm has fueled many inventions. Never count out enthusiasm, determination and hard work. Q13. Do the founders have the right mix of expertise and do the team members complement each other? Q14. Are the founders enthusiastic and willing to work hard? The questions are set up so that if you answered “yes” rather than “no” to a question, there would be less project risk. Lower risk usually means that the project is feasible. But that does not mean that risk aversion is the goal. There is usually a trade-off between the level of risk and potential returns. There are numerous examples where high risk projects produced numerous millionaires and hyper-profitability. I had thought about developing a simple scoring model where you could compare different projects using the questions, but I think that would also be a mistake. Selecting the project with the highest score might eliminate a project that could change the world or perhaps just lead to financial security. The march to innovation should be in between a turtle’s and a rabbit’s pace. You have to give the idea time to mature, but not move too slowly because the idea will wilt on the vine. I suspect a kindergartner pace would work best. Just don’t spend too much time pondering the questions and don’t just race from question to question. Ponder, race, prototype, ponder, race, prototype, ponder race prototype ….